Summer is almost upon us, and the beach life is the good life. Victoria has some of the finest beaches in the world to spend your summer days sun bathing, surfing, and snorkelling. We’ve already told you what to wear this summer with our Ultimate Summer Swimwear Guide, so now here’s where to wear it. The wonderful bathing boxes of Brighton Beach are an iconic image of Australian beach culture. Tourists will flock to see these remnants of the more modest Victorian ideals. But the bathing boxes are not the only reason to bring the camera -at just the right angle, the view to the city is absolutely stunning. Also good for paddle boarding or getting a sailing class in. The Ninety Mile beach is exactly what the name suggests, a 90-mile long stretch of pristine golden sand that separates the Gippsland Lakes from Bass Strait. It’s one of the longest uninterrupted beaches in the world and is perfect for a swim or some beach fishing, or if you’re lucky enough, you might even get in a spot of whale and dolphin watching. One of Victoria’s best kept secrets, Refuge Cove is a tranquil, secluded beach located on the east side Wilsons Prom, accessible via walking track from Sealers Cove to the north or Little Waterloo Bay to the south, with stunning views along the way to keep you busy. There’s a campsite there if you feel like staying, and it’s great for fishing or taking a dip in the beautiful water. 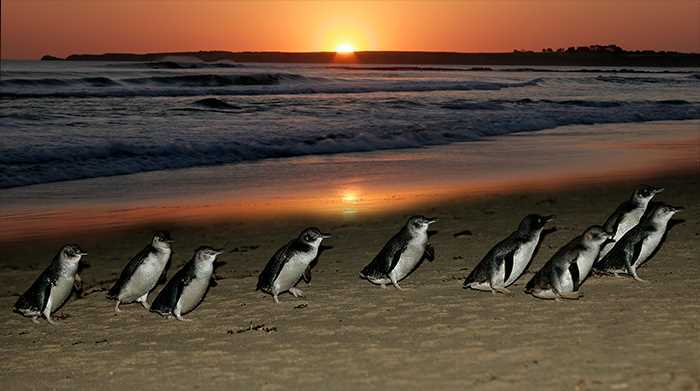 The surf is great around Philip Island, and there’s opportunities for fishing and snorkelling too, but the real superstar is Summerland Beach and the Penguin Parade. The daily parade of these adorable penguins draws tourists from all around the world and it is a site to behold as the penguins waddle up from the shore to their burrows. A right of passage for all Victorians, The Great Ocean road alone is worth the journey is to get here, but on arrival the wonder of The Twelve Apostles will knock your socks off! Bring a camera and a picnic and chill out on the sand, surrounded by these breathtaking natural sculptures. Bells beach could be considered the most renowned surf beach in all of Australia. Not only is it home of The Rip Curl Pro Bells Beach, the world’s longest continuously running surf competition, it’s also the location of the final scene in Point Break, the greatest surf movie of all time. And if Bodhi and Johnny Utah fly all the way here from the states to catch a wave, then you know it’s gotta be awesome!